Protesters took to the streets of Podgorica, capital of Montenegro, to call for the resignation of the country's prime minister, Milo Djukanovic, over alleged election fraud and corruption, urging the formation of a transitional government. PODGORICA (Sputnik) — Several thousand protesters are participating in an anti-government rally in the Montenegrin capital of Podgorica on Saturday, a RIA Novosti correspondent reported. Protesters took to the streets of Podgorica to call for the resignation of the country's prime minister, Milo Djukanovic, over alleged election fraud and corruption, urging the formation of a transitional government. The peace rally is also aimed against Montenegro‘s NATO accession under the Freedom or Nothing slogan. 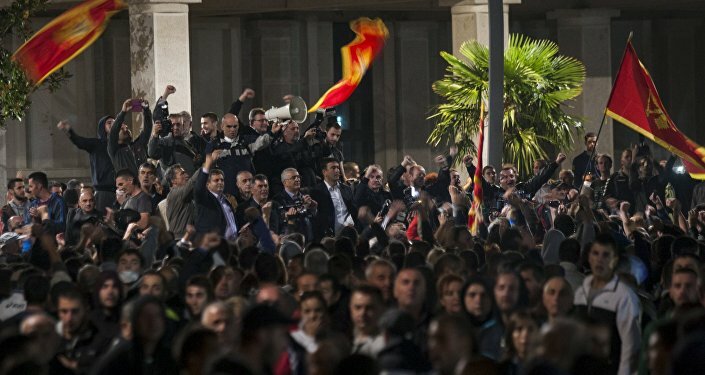 Last week, Montenegrin police forcefully dispersed a campsite of the opposition in Podgorica, the site of a prolonged protest in front of the parliament. On October 15, NATO Secretary-General Jens Stoltenberg said that Montenegro was moving closer to becoming a NATO member, but said that more reforms and public support were needed.